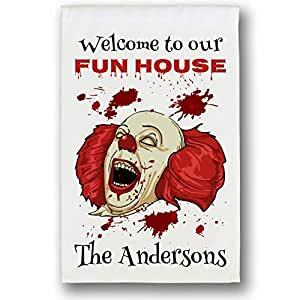 Welcome to our Fun House Scary Clown flag, personalized just for you. Customized with 1 line of text of your choice, up to 20 characters per line. Made from 100% solution dyed polyester marine fabric for long lasting outdoor use. Made with a sleeve at the top of the flag to slip onto a garden flag stand (not included). NOTE: Everyone’s names and/or custom text fills the space on the flag differently. Your personalization will be arranged to best fit and fill the custom space on the flag. Spacing and text size may be adjusted for visual appeal and balance. Due to the difference in length of names, city/state, etc., the text on your flag may fit differently than the listing sample and the customize form.